Construction for America's Cup begins. Will the jobs follow? Big changes are afoot along the San Francisco waterfront, where demolition crews are taking apart an old cruise ship terminal to make way for the America's Cup, the glamorous yacht race that will take over San Francisco Bay in 2013 -- and that will bring tens of thousands of jobs and billions of dollars to the Bay Area's economy. The development is certainly underway, with old piers being replaced, a large steel structure put on Pier 27 to anchor the America's Cup village, and hotels and condos along the waterfront are on their way, too. But preliminary races in San Diego last year failed to attract the large crowds organizers promised, leading the event authority to scale back crowd and money estimates in reports to San Francisco city leaders. Yet Mayor Ed Lee remained buoyant, according to the Bay Citizen. "Some people, when they came back from San Diego, were saying, 'Well, maybe it should be scaled back,'" said Lee, who says that 500,000 people could still visit San Francisco during "peak race days." "But I think there’s more momentum building for our event because it’s so different." San Francisco was the only city to bid for the cup. Initial estimates said the crowds could be as big as 600,000 people. Right now, three teams are registered to race catamarans --- two-hulled sailing boats -- between Alcatraz Island and the Marina District. Up to nine teams were at one point expected, but organizers say more could pay the $100,00 racing fee and build their boats in time to enter the initial contests. 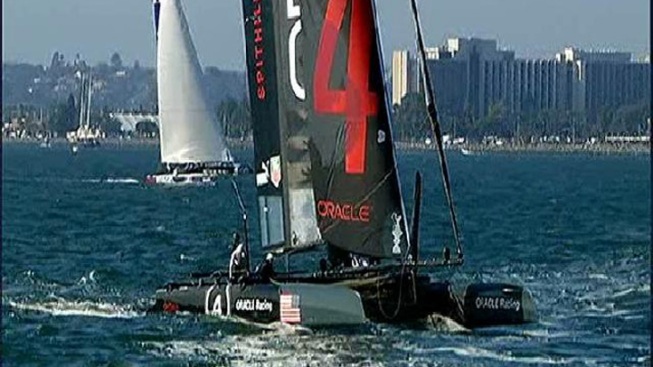 The winner of the preliminary races wins the rights to challenge Oracle CEO Larry Ellison's Oracle Racing Team for the actual cup, a silver trophy from the 19th century, the Bay Citizen reported. It was Ellison and his business partners who received some prime waterfront property in exchange for bringing the cup to San Francisco, an arrangement that has stirred considerable controversy. Waterfront development rights are extremely rare in California, and even more so in San Francisco, where even small parcels near water fetch enormous sums. Races in 2012 are on 45-foot catamarans. The "real deal," the Louis Vuitton Cup series, is on 72-foot boats in July to September 2013, with the final best-of-nine races for the cup after that.